Wow. Today was a lot. 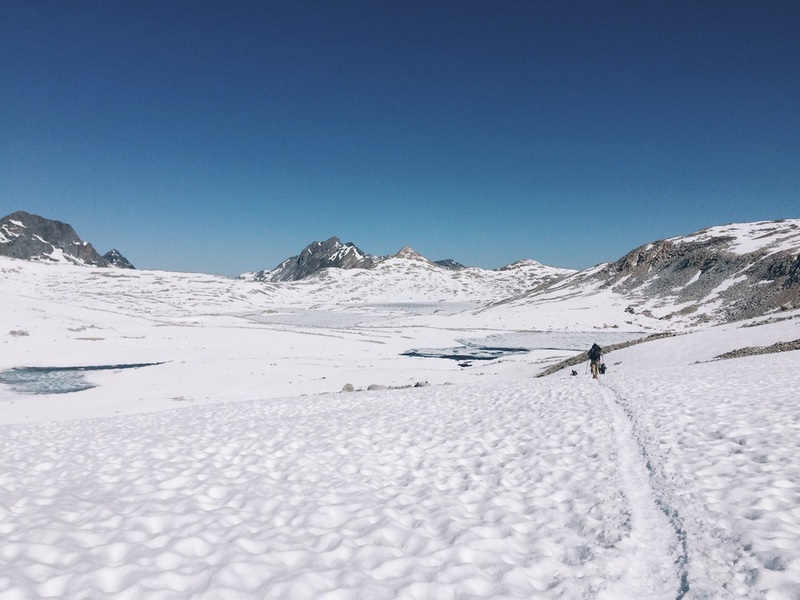 I woke at three to get a head start going over Muir pass. The full moon was out and the temperature was just perfect. I walk only .4 miles and come to a huge river crossing. It was still dark out so I couldn't see how deep the water was. I tried going up stream to see if I could cross but it didn't connect. I even stumbled upon a great campsite and took a poop break to kill some time until it got a little brighter out. I was just nervous about crossing by myself in the dark. I finally felt comfortable knowing how deep it was and just went for it. The water was FREEZING and there was no sun out to warm my feet up. It was pretty painful but headed out shortly to try to regain feeling in my toes again. ET and Heffe going up to muir pass. Huge snowfield. Reminds me exactly of camp Muir. I followed a bunch of snow tracks and then got confused bc the tracks just ended and went straight up. I checked my gps and I was off trail so I climbed all the way down and followed the trail, which was mostly covered in snow. Then it stopped and I was just totally lost. I walked back down and sat on a rock to wait for someone to come by. I finally see ET and Heffe come down and ask for their help as I was lost. We ended up going back up the steep snow tracks and it finally connected to the trail. I fell in a posthole early on and my whole shoe was stuck in there. No fun. Most of the way up was on a snowfield or lots of rock. It was really annoying walking on rock w spikes. Sketch coming up behind me. We finally made it all the way up to the Muir shelter on top of the pass. There were quite a handful of hikers up there. We all hung out there for a bit but knew we had to get down quick to avoid the slush and postholing. It was snow field for several miles and it was turning into slush fast. I fell in a hole face forward and it was scary. We all took a break by this thawed out lake and it was so beautiful. I got some water and took an early lunch. The rest of the afternoon I wanted to make the push to evolution creek, the crossing where you go waist deep, so they say. I hiked a bit with Pete aka Sketch for a bit. He knew me from Instagram and asked me a bunch of questions about myself. No one has really done that yet here so that was interesting to talk about yourself. I also leap frogged with All Day Long aka ADL for a bit. He's the older guy that's really inspiring to me. It's been nice to get to know more people in my wave. Rounding lots of frozen lake. The guys at the lake for lunch after climbing the pass. When I got to the crossing, it looked super calm. ADL was already there and helped me cross. I hiked up my backpack high on my waist and went for it. The water only came to my crotch and hit just below my hip belt pockets. The current was a bit stronger in the middle but it wasn't bad. By now, my feet have been soggy since morning. I knew my blisters were getting worse and they just started hurting really bad from all the wet feet rubbing. After the crossing, we would have about five miles until camp. I decided to focus real hard and knock out the miles. But first I slipped and fell into mud and it was gross. So at the next crossing, I went and sat in the water hoping some of the mud would rinse off. The last few miles felt like forever and my feet were hurting bad from the sogginess. I started walking all off key from being so exhausted. It was another 21 mile day in the sierras. Not exactly sure how these things happen. I finally reached our site with ET and Heffe and was so happy to be done. I immediately ripped off my shoes to inspect my feet. They were all white and wrinkly and I had this gnarly blister. It was so painful. I really need to take care of my feet better out here but I just don't know how to keep your feet dry with all the crossings and since most of the trail is a river. This wet feet thing is really intense. Mike and Jackie finally make it to our campsite and I was happy they made it. I feel like our little group are trail bffs. I've been counting my food and it looks like I may have enough to get me to mammoth lakes. I was going to stop at vvr for snacks but I don't think I need to. It'll be nice to go straight to red meadows. Tomorrow is another pass at the end of the day. Not sure what time I'll wake up but I need rest.